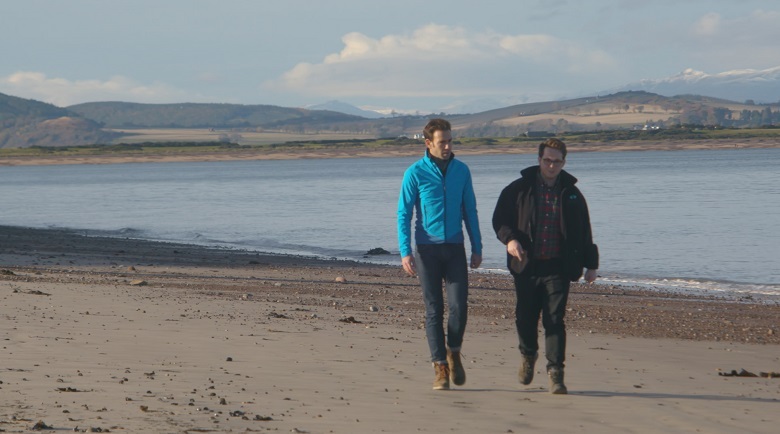 Presenter James Crawford takes us behind the scenes of the new series of Scotland from the Sky, exploring Scotland’s changing coastline, from amazing herring harbours to abandoned art deco swimming pools. The first series of Scotland from the Sky was an ‘origin story’. It explored the revolutionary combination of powered flight and photography in the First World War and how it went on to play a major role in everything from redesigning our cities to uncovering thousands of previously unknown archaeological sites. 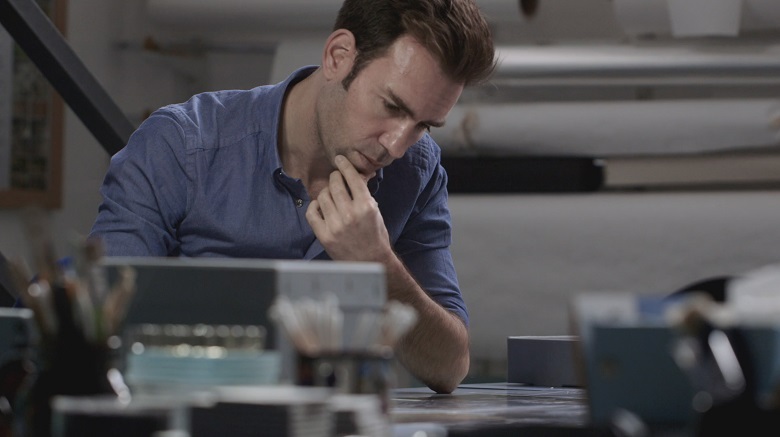 We also learned how HES came to hold one of the world’s largest and most important aerial photographic archives. Our challenge with Series Two was where to go next. We wanted distinct themes for our three programmes. We knew the great strength the view from above has for storytelling and tracking change. It shows how places can evolve, but also how traces of what have gone before can remain, like ghostly imprints. Our solution was to look at three key aspects of Scotland’s landscapes and history. Our countryside, our industry, and, for episode one, our coast. Scotland’s coastline is rugged and beautiful. It’s made up of over 11,000 miles of cliffs, crags, bays and inlets – each with their own stories. It’s where we built many of our first homes. It’s where we looked to for food and trade. It’s where we first watched the arrival of invaders, of refugees – of war. It has shaped who we are and how we live. We began with a coastal feature that is almost entirely forgotten today – despite being something that we started building thousands of years ago, and which stayed in use even into the twentieth century. You can still find the remains of hundreds of them along Scotland’s coast. 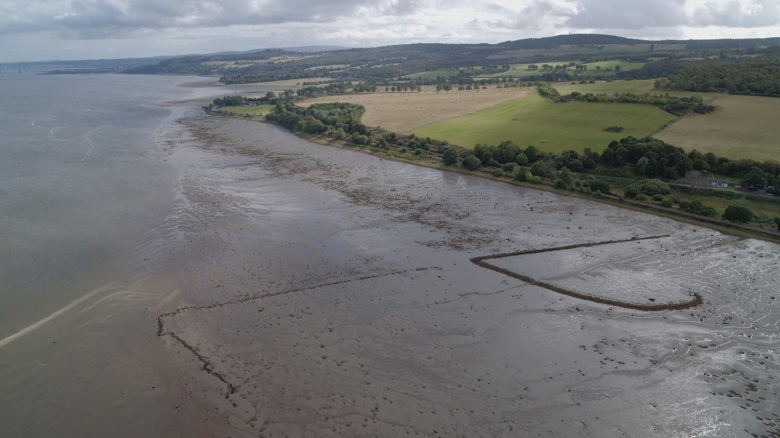 On the Moray Firth, there are traces every mile and a half. They are fish traps. From the ground, they just look like piles of stone or rubble. But get up in the air, and they appear – quite appropriately – like giant, man-made hooks. In the end, they were so effective (one account tells of some 2600 salmon taken from a trap near Thurso in a single day) that the construction of new traps was banned by parliament in the 1860s. The result is that the remaining traps have become fragments of a lost way of life. From above their imprints still stay strong in the landscape. But time and tide will take their toll – and eventually, the last traps will disappear. This is how it is with our coast. It’s littered with the traces of how we used to live and work. And it’s also undergoing constant change. From this starting point, we set off all over Scotland. Our journey took us to the tiny island of Mousa on Shetland to explore the wonderfully Scottish enigma of the broch – huge, round stone structures, built for reasons that we still don’t fully understand. And next we were off to another island – Canna – in search of one of our most mysterious Christian sites. 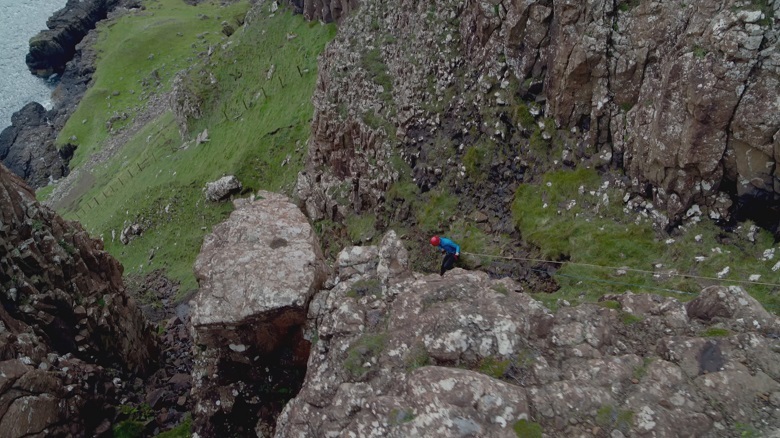 It also just so happened to be one of our most inaccessible: found at the bottom of a section of massive cliffs, several kilometres from the end of the nearest road. Our only option was to abseil down. What waited at the foot of the cliffs – known as ‘Sgorr nam Ban-naomha’, the ‘scree of the holy women’ – was a remarkable monastic site, first established some 1,500 years ago. From these ancient remains we moved on to more modern-day stories. 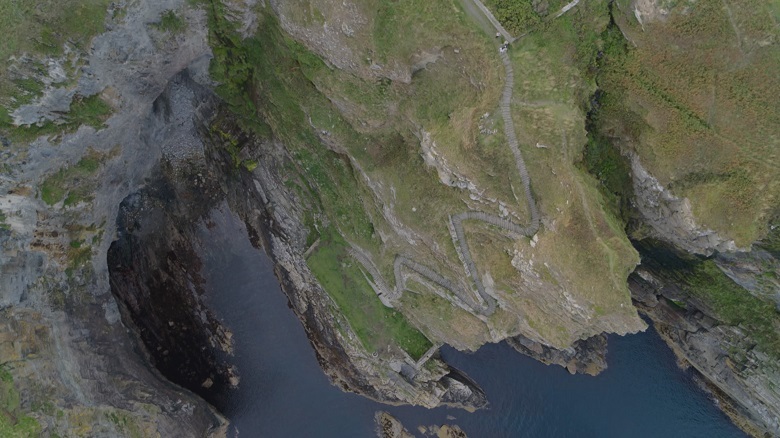 Just south of Wick, we used our drone to capture a spectacular view of the Whaligoe Steps. Here a series of three-hundred-and-sixty-five stone steps lead up the side of a sheer cliff face. Women known as ‘herring girls’ used to haul the catch from a tiny harbour some 250 feet up to the village at the top. While the fish have gone, this site remains – an enduring and poignant monument to the communities who worked the herring. We travelled on to Britain’s oldest business, Aberdeen harbour, and then further north, to a tiny inlet west of Macduff. 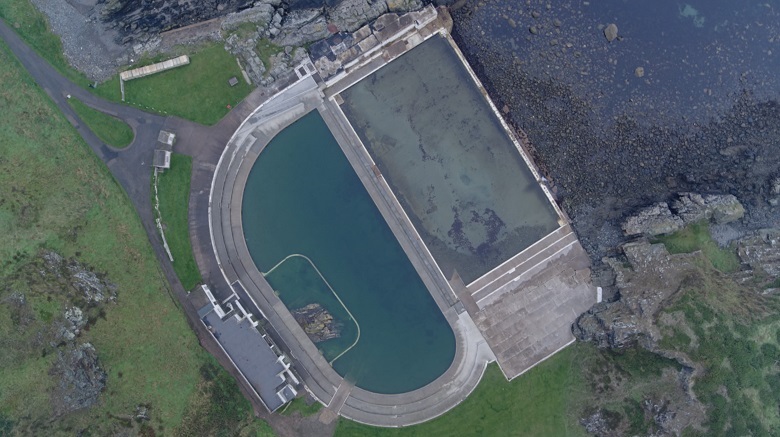 Here, at a place called Tarlair, we explored the ruins of a seemingly unlikely feature of the Scottish coastline: an outdoor swimming pool, known as a ‘lido’. For the government of the 1930s, the lidos were all about public health – promoting physical and mental excellence. But for others it was less about rigorous exercise and more about simple pleasure. Lidos were where you went to see and be seen. Some lidos were huge – Stonehaven had seats for 3,000 people; Portobello could hold a staggering 6,000. They became icons of municipal pride, with every town vying to build the biggest and brightest. But by the latter half of the twentieth century, the fad was over. Why swim in the North Sea when you could fly to the Mediterranean? From above you still can spot the traces of many of the abandoned pools – their ruins fading back into the cliffs and the rocks. They add yet another – rather unexpected – layer to the long history of our coastline. 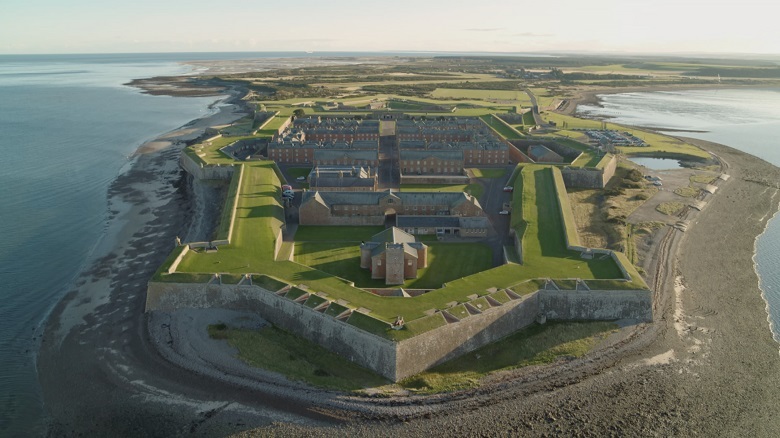 Fort George is right on the firing line when it comes to coastal erosion, as HES climate scientist David Harkin explained. Our experience of making this episode showed us that you can take almost any beach, bay, dune or cliff-side and you’ll find the traces of us, of people. Our shorelines have stood for survival, threat, opportunity and adventure over many thousands of years. Yet a day doesn’t go by without the inevitable shift of this physical border – from the coming and going of the tides, to rising sea-levels and the never-ending process of erosion. 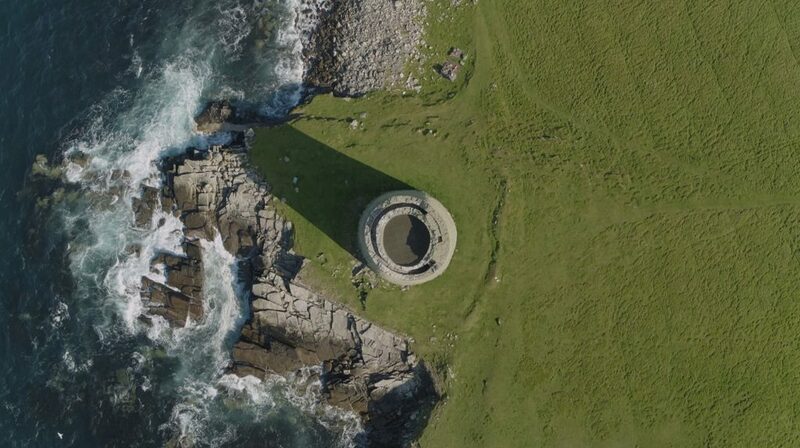 What we see when we look down on our coast from above is a landscape rich in history and memory. But it is also a landscape that never stops changing. At once enduringly vibrant – and dangerously fragile. 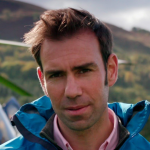 Series Two of Scotland from the Sky takes-off at 9pm on BBC One Scotland on 17 April. « Where to Eggsplore this Easter!